We don’t have cable so we didn’t see your TV appearance, but we’re sure it was good. Are you happy with your slide now? Or are you still having to be teased onto it with a popsicle? It looks like a lot of fun. Oh I loved your TV appearance. You should have your own show! 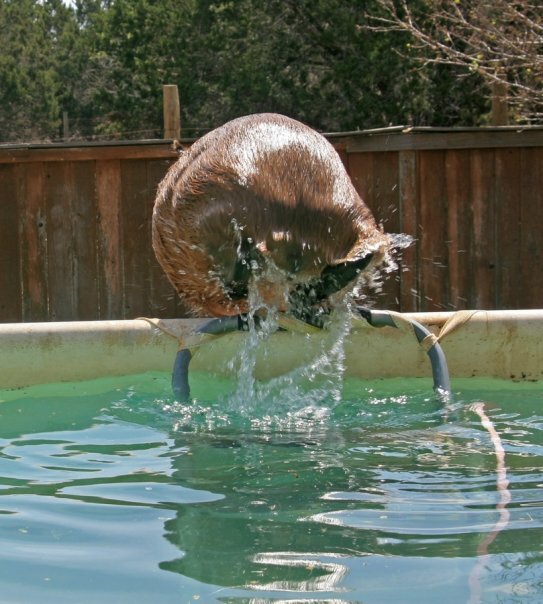 Caplin, that looks like fun! 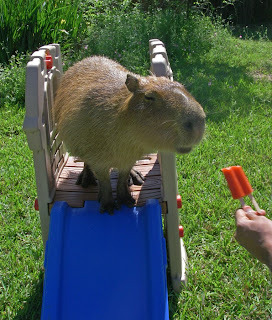 I hope you start to enjoy sliding down the slide all the time. I can be bribed to do tricks for treats too. Only I like dried-up liver treats. Thanks Mary Ellen! 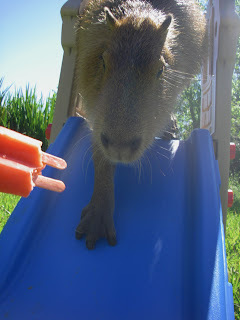 Those are some cute baby capys! Cool castle, Caplin! My humans humiliate me all the time too. Aren’t humans weird? 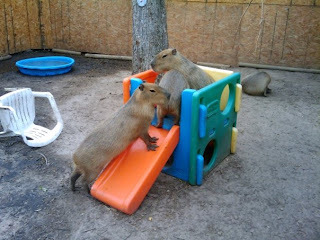 Hi Caplin – I think the best way to enjoy a slide is to sit at the top indefinitely! 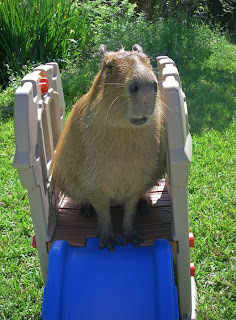 I heard about you on Jan’s Funny Farm and thought I must come over and say hello! You really are an unusual pet! But you look like your humans really love and spoil you! 🙂 And how exciting to be on TV – wow! 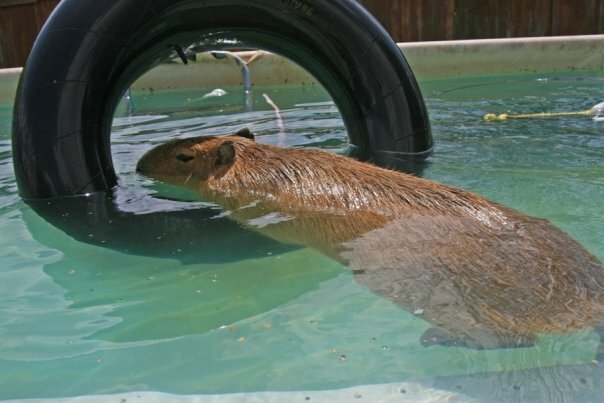 Oh, Caplin, you poor capybara. 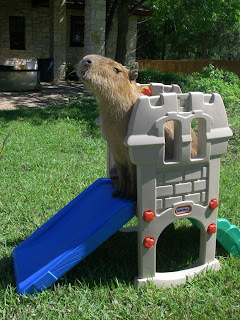 That slide looks scary! I hope you get used to it soon so you can get lots of popsicles! I am hosting a Pet Parade on my site tomorrow, 4/29, where people can link up to their pet posts and/or photos. If you want to, I would love to have you link up to a Caplin post or photo there. 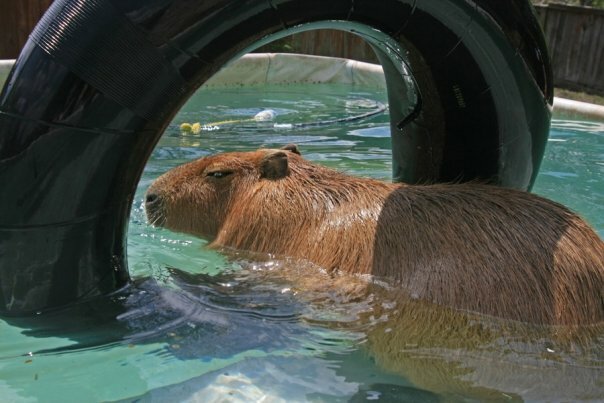 I think there are a lot of people that would love to learn about a famous Capybara! 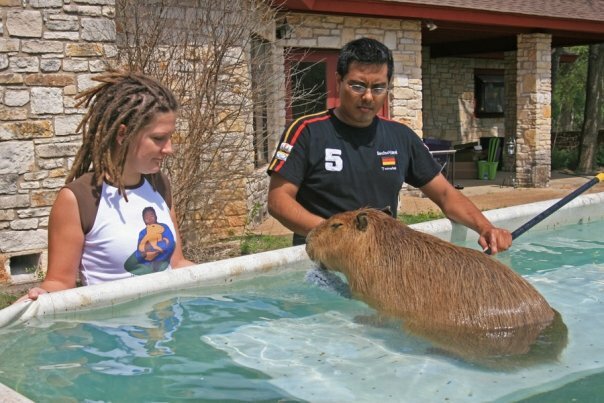 Can you believe that I was at a family gathering over the weekend and they thought that Capybaras were the same as javalinas?! I set them straight! Caplin, thank you for adding this to the Pet Parade! That would be great if you add a link to your post tomorrow! I am going to keep the parade going through Friday as long as there are still marchers! 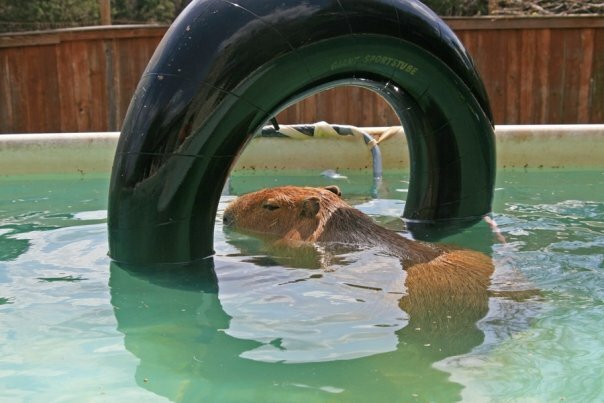 I’m visiting from Gayle’s Pet Parade…. 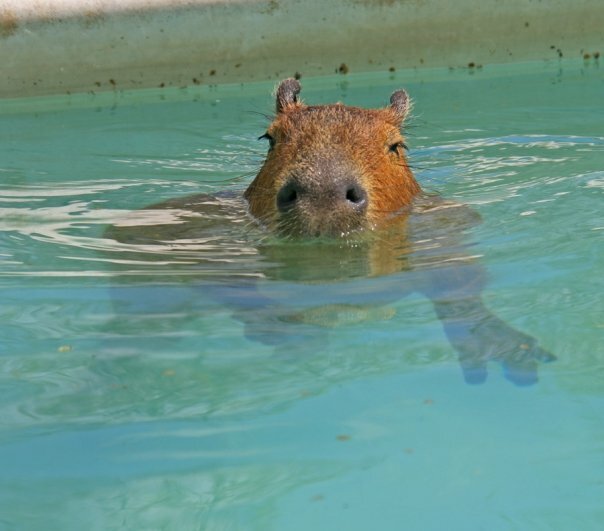 I have no idea what a Capybaras is, so I’m off to Google to find out!! Oh, my! This made me laugh out loud. Well done. Oh my goodness, I have never seen one before. My son recognized it right away. Seriously? 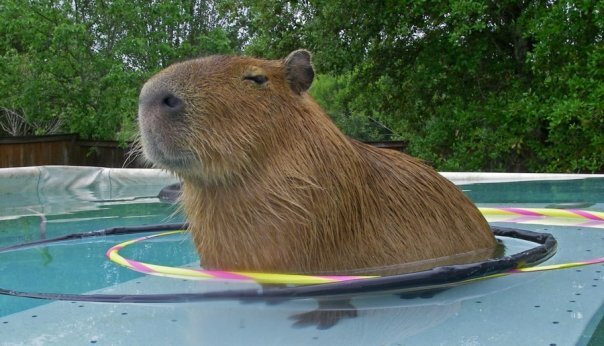 A capy? this is the funniest thing i’ve seen in a while. so glad you joined the parade and i got to meet this fine creature. 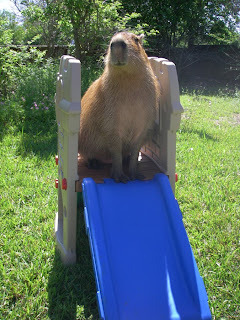 Well I think you should just enjoy the slide for what it is and wonderful diversion. Your owner obviously loves you ver much to try and get you a gift like this and you look like you might be enjoying it maybe just a little bit. 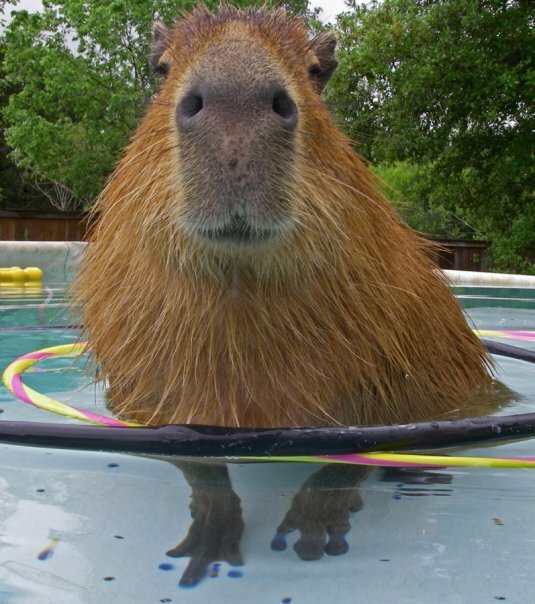 You are a gorgeous capy by the way.